NEW ARRIVAL;; Look closely at this very clean 2010 Nissan Pathfinder S that just arrived here at Boyles Auto Sales. Nicely equipped with Keyless Remote Entry, Leather Seating, 3rd Row Seats, AM/FM/CD/AUX Radio, Tilt Steering, Cruise Control, Rubber Factory Floor Mats, Roof Rack, Factory Towing Package, and much much more. This 4.0L V6 is a power plant, so you can expect great fuel mileage and plenty of power too. This Pathfinder handles perfect in town and it's a blast to drive out on the road. It's quiet in the cabin and has a great feel to it all the way around. Good Carfax too so you can buy with complete and total confidence. 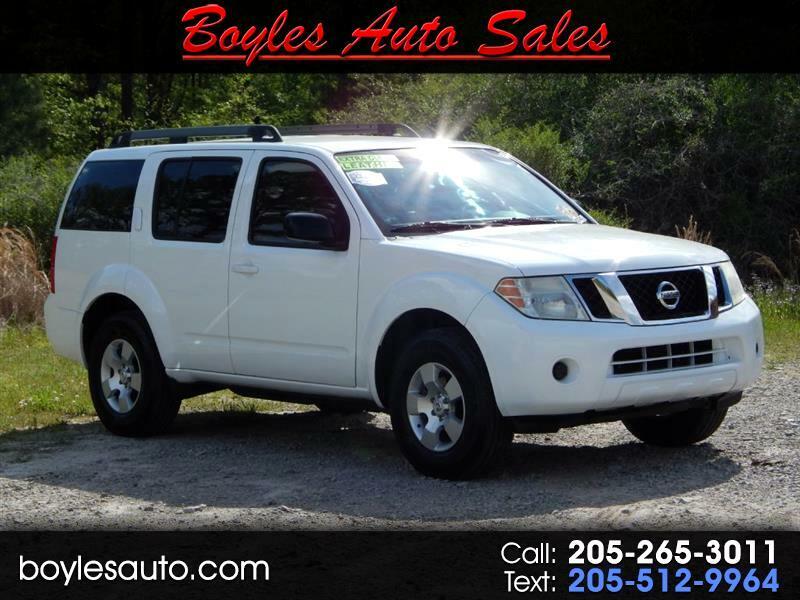 Make the short drive to Boyles Auto Sales and see this Pathfinder for yourself. You'll be impressed. We offer convenient bank and credit union financing with Low Rates, so you can drive this Pathfinder home today. Visit us online at boylesauto.com to learn more about this truck, or to submit a credit application for faster financing. Call Randy at 205 269 3196, or Scott and Tucker at 205 265 3011. Thank You for Looking! !